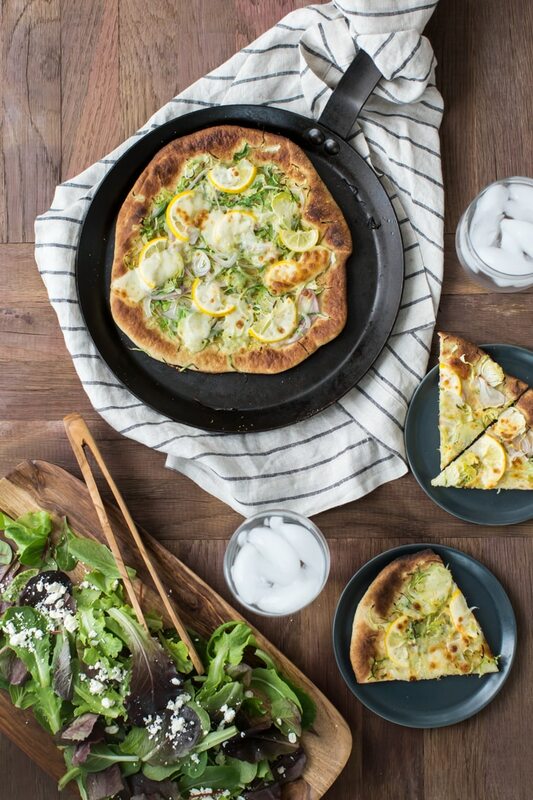 Meyer Lemon Pizza with Brussels Sprouts | Naturally. When M and I first got together, I was right out of college and I had about 0 cooking experience. However, I had just started this blog (for baking, not for cooking) and I was feeling more adventurous in the kitchen. And so, I’d invite M over for dinner. I distinctly remember the first time I made homemade pizza. I had to pull the smoke detector from the wall of my apartment, the crust was horrible, and M was ever so gracious (I attribute this to his not ever eating a home-cooked meal, so anything was better than nothing.) However, I knew the pizza was crap and from that moment on, pizza has been one great experiment with many trial and errors. Fast forward to today and I’m still playing around with my pizza. I have two pizza stones and now this steel pan (which is why I’m sharing this recipe with you). Turns out, I have a new favorite way to make pizza that creates an excellent crisp crust on the bottom and a gooey cheesy top (without setting the smoke detectors off). I use this 11″ season steel pan first on the stove top then transfer it into the oven. Sure it’s not how one might normally make pizza at home, but it gets the job done (and creates these wonderful personal sized pizzas!) Add to it a bright and light topping of Meyer lemons and brussels sprouts, it’s a winning dinner. Lodge Cast Iron was nice enough to let me giveaway one of these pans as well as one of their 10″ seasoned steel skillets (cooking surface is 8″). Details to enter are below! In a bowl of a stand mixer, combine the water, yeast, and honey- stir with a wooden spoon until yeast is dissolved. Let sit until yeast begins to activate, 5-10 minutes. Once yeast is ready, add in oil, salt, and 1 cup of the whole wheat flour. Turn your mixer on low with the dough hook on and let mix, scrapping down the sides as needed. From here on out, add 2-4 tablespoons of the all purpose flour at a time, letting the dough mix for a bit until adding more flour. When the dough starts to come together, continue to let the mixer run for 1-2 minutes and adding more flour until your dough has just pulled away from the sides of the mixer. Remove from the mixer and place in a warm spot. Brush with oil and let rise for 1 hour. 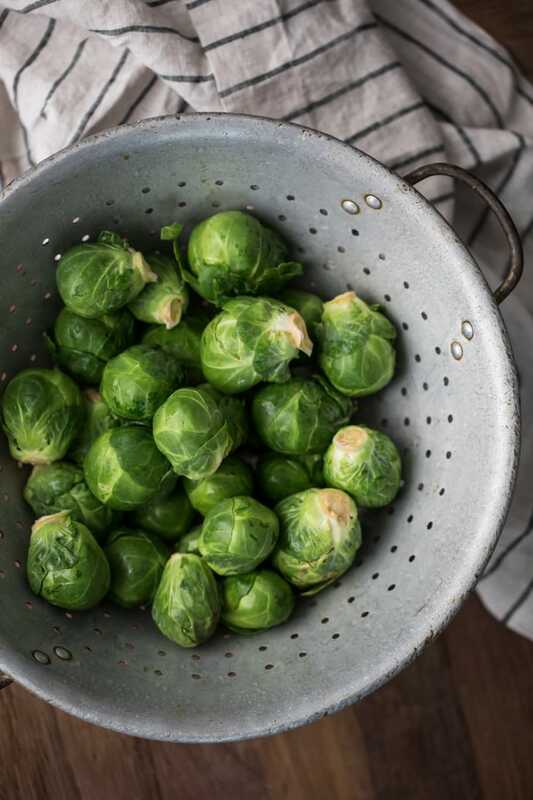 In a food processor fitted with a slicer attachment (or using a mandoline or sharp knife), shred the brussels sprouts and shallots, set aside. Thinly slice the meyer lemon into circles, then each circle into a half moon, removing seeds as needed. Preheat the broiler and place a rack in the upper third of your oven (but not the highest rack). 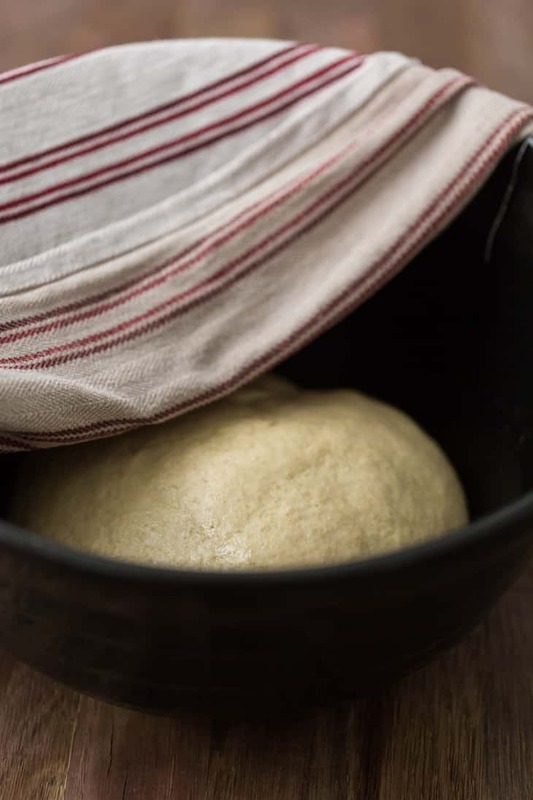 Divide the dough into 4 balls and working with one ball at a time, roll out the dough into roughly an 10″ circle. Preheat a cast iron or seasoned steel skillet over medium heat on the stove top. Transfer the dough to the skillet and brush the top with olive oil. Sprinkle with the Brussels Sprouts/shallots, then a few meyer lemon pieces, and finish with 1 to 2 ounces of the smoked mozzarella cheese. *I usually only make 2 pizzas and freeze the remaining dough for another pizza night. * For those nights I forgot to make dough, I love Trader Joe’s or Whole Food’s fresh whole wheat pizza dough! My favorite combination would be beets and pesto. But I’ve never tried brussels sprout pizza, so that might be a new favorite! My favorite toppings are marinara + basil + tofu ricotta + roasted veggies. I usually make my crust on the stove first before putting the whole pizza under the broiler to cook the toppings! I’d love to try that with the steel pan. I actually love brussels sprouts on pizza! My fav pizza has brussels sprout leaves, guanciale, a white sauce, parmesan, fior di latte, and truffled farm egg – from Barbuzzo in Philadelphia. Yum! Lots of vegetables; basically a salad on a piece of bread! 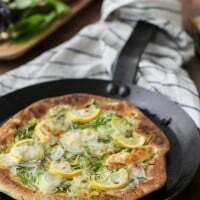 =) I’ve never had brussels sprouts on pizza and the combination with Meyer lemon sounds genius! My favorite pizza topping is kale. I love how crispy it gets in the oven. It’s like eating kale chips on your pizza! Yum! Wow this sounds so lovely thanks for sharing this recipe. Love anything with sprouts ! I’d have never considered brussel sprouts and pizza, but this looks stunning! I’m a sucker for big bites of mushroom and spinach between creamy goat cheese and barely-done dough. I’ve found it’s a great savoury fix for vegetarians! My favourite pizza topping is tomato! My favorite pizza toppings are not unique, but I’m always up for trying new things. My must haves on my “normal” pizza are olives, and fresh mushrooms and peppers. There are too many possibilities from which to choose favorite. Thanks for this opportunity. I’m intrigued with this recipe, and will be picking up some Meyer lemons and Brussels sprouts this weekend. Usually my go-to pizza toppings include roasted mushrooms, caramelized onions, rosemary, sliced pears (when in season), and a combo of taleggio/fontina and fresh mozzarella cheeses. I’d have to say my favorite topping is cheese – any cheese – and lots!! Cheese. Lots of cheese. My favorite topping on pizza is cheese. Multiple kinds on one pizza. Yum. This is an interesting combo and not one that I would have naturally put together. I use my Lodge skillet for everything! It’s the best. Do you have any tips for cleaning a cast iron skillet? I think this is perfect for the seasonal Sprouts available from my local delivery peeps! Fresh tomatoes, ricotta cheese, zucchini & mushrooms….a drizzle of olive oil too, of course! Oh my goodness…this looks so fresh! The colors are gorgeous and it just sounds heavenly. Beautiful. Red peppers all the way. Meyer lemons and brussels sprouts are so delightfully unexpected! And so different from my favorite ham…accompanied by pineapple of course 🙂 What can I say, I’m a traditionalist at heart. That looks divine, thanks for sharing! Hands down black kalamata olives and fresh tomatoes… yum! 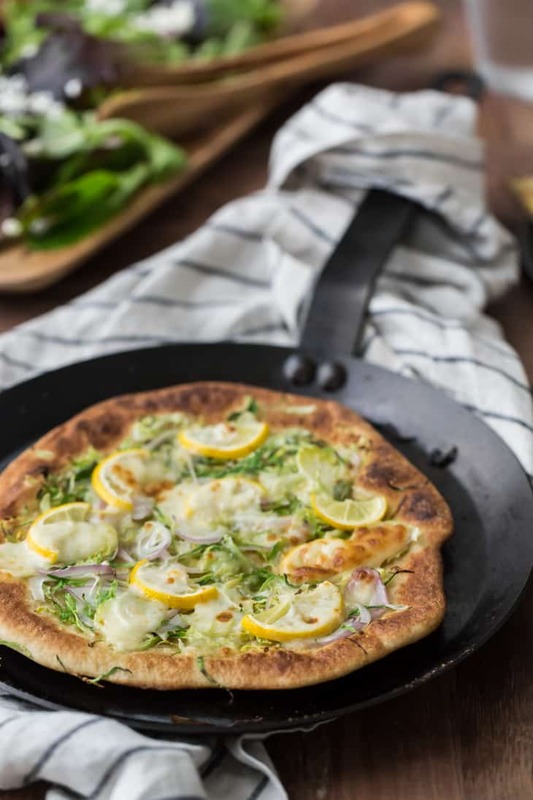 This lemon pizza looks AMAZING though… cannot wait to try it! I love the classics- basil, mozzarella, and fresh tomatoes! Goat cheese, red peppers, sausage and mushrooms! I don’t have one favorite topping, but one of my favorite pizzas has dijon chicken and broccoli on it. Yummy! Arugula with parm and lemon! Fresh and delicious. Question: If I don’t have a stand up mixer, could I do it by hand? I would really love to try this, I actually just came back from whole foods with all my ingredients ready to take action! Also, I want to thank you very much for this blog and all your creativity and generosity in sharing! haha I come to your blog at least 3-4 times a week hoping there is a new recipe (if not daily haha)… you (and your blog, of course) are such an inspiration! so THANK YOU! Thanks:) will certainly try that this week! I love mushrooms and onions on my pizza but sure would try the Brussels sprouts and lemon because I love both but never thought to put them on a pizza! Looks delicious! I am a real pizza lover! My favourite toppings are : tomato sauce + mozarella + italian ham (uncooked) + arugula, or mozarella + green onions + eggs. And I think that Molly Yeh’s shakshuka pizza will be a favourite too! These are wonderful pans to cook with!!! The pizza looks wonderful!!! Ah wonderful, thank you Erin!! A friend’s meyer lemon tree is exploding, and my fridge is full, and I’ve made & eaten more lemon cookies/bars than is healthy. Such a fresh new way to use lemons in a main course, I can’t wait to try this! Tomato, basil and mozzarella…traditional but it never fails to satisfy! I made a great pizza with blue cheese mushrooms and buffalo chickpeas! Sausage and red onions on a thin crust pizza. YUM! Wow. What an interesting combination! And I love Brussels sprouts. My favorite topping is either mushrooms, or lots of onions. What a neat new way to make pizza! I’m excited to try this out with my cast iron pan. I love the unique topping as well. I’ve had lemons on focaccia bread so I get the amazing taste, never had Brussels sprouts on my pizza but its so worth a try! I simply cannot handle how yummy looking that pizza is. I don’t think I’ve ever had pizza that has lemon on it. I am beyond intrigued!